Are you Bilingual? Become a Tutor! How about tutoring children/adults in conversational practise of your language? This can be highly lucrative - contact your local Schools/Higher Education Authorities to offer your skills. Alternatively join an existing tutoring business like ones we have listed here. Renting a room in your house to a lodger/student/foreign student. Take a look at Spare Room and Room Buddies. Here’s a pleasant surprise, if you rent out, or are considering renting out, a room in your home you can earn up to £7,500 a year in tax free income. If you find a good wholesaler then you could have a captive market for children's clothes at Playgroups/School. If you decide to specialise in 'older' clothes (particularly jumpers or cardigans) then there are many opportunities to go into Nursing Homes and supply clothes to elderly people who may not be able to get to the shops. Or why not give selling jewellery a try? If you live in an area where there is high demand for Mother & Toddler groups then as long as you can fund buying toys and source appropriate premises then you can charge mothers to attend. There are already business that we have listed on mumandworking that offer a ready made baby and toddler play class, you may want to join on of them? You can offer to sell items for people with no time to list items (or perhaps for people who are not internet-savvy), charge a small commission. See 42 selling on ebay tips here. For mothers hosting children's birthday parties. One of the real hassles of having a kids party is buying/preparing take-home party bags. Offer ready-made bags with age appropriate/gender appropriate party gifts (bought from wholesalers). mumandworking brings you an in-depth look this area of work. We have looked into lots of jobs you can do from home which involve writing. We've interviewed Mums (and Dad's) currently doing the job so they can tell you all about it and how it fits round their family life. Find out more about writing here. If you are creative look at making wedding invites, christening invites, party invites etc... We've got a great deal of Creative, Craft or Cooking career ideas. We've spoken to a variety of Mums and Dads running their own business where they make something - everything from handmade cards to chocolates! They have all told us their story - what inspires them to be creative, how they have set up in business and most importantly how it fits round family life. There's many courses that you can start to give you the skills you'll need to become a qualified beautician, hairdresser or think outside the box and offer fashion advice. Find courses here and how to become a hairdresser here. Companies, both big and small, are interested in what you have to say and are willing to pay for your opinions. Get paid to give feedback on various websites. Use your own computer from home, the testers software records your screen and spoken thoughts. You'll be completely based from home and work when you can. 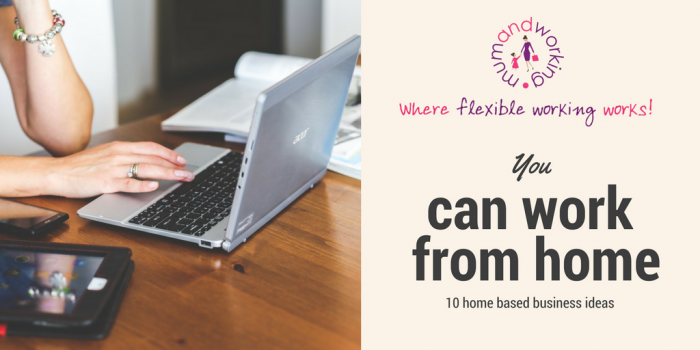 Take a look at completely home based jobs like these here.